Who was the Samaritan woman? Tell about her life after meeting Jesus? Who were the Samaritans? Describe their religion and relationship with the Jews. What time did Jesus meet the Samaritan woman at the well? Is there anything odd about this time? Why do you think she drew water at time? 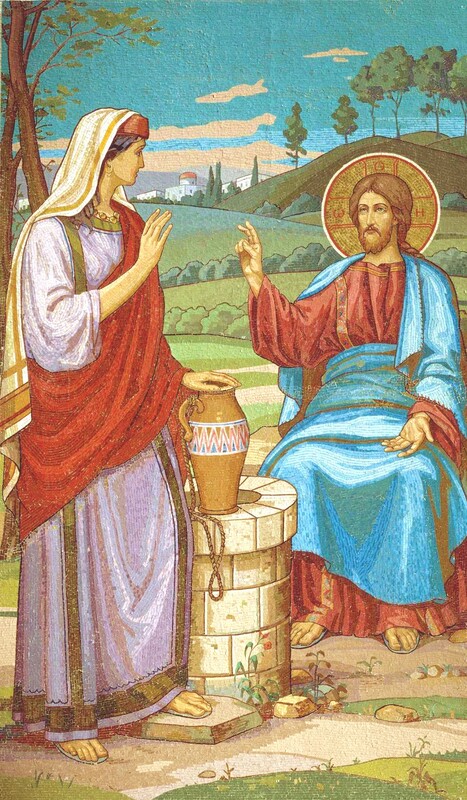 What 2 revolutionary things did Jesus do by even talking to the Samaritan woman? The proud Pharisees would have judged Him on at least two accounts. Water plays a big role in the story of the Samaritan woman. Cite at least 5 other places where water is used to describe or point to our salvation. What is the meaning of "water" in this context? There was a significant prophesy concerning salvation which Jesus made when He spoke to the Samaritan woman. What was it? Approximate when it was understood by the entire church to be fulfilled (or being fulfilled)? The conversation between Christ and the Samaritan woman mystically is actually another conversation between what 2 parties? Compare and contrast the reaction of the Samaritan woman and townspeople and the townspeople in the region of the Gadarenes when Jesus visited them. "If ye believe not that I am He, ye shall die in your sins" (John 8:24). These are frightful words. St. John Chrysostom tells us (http://www.ccel.org/ccel/schaff/npnf114.iv.lv.html) that Christ came to take away the sin of the world, and that in baptism our sins are washed away and we "put off" the old man, our sinful nature. Sin is a frightful thing, for it separates us from God. Christ came to free us from our sins and unite us to Himself. But if we choose again the old man, the life of sin, what then? St. John: "Wherefore He said, “He that believeth not is judged already”; not merely through his not believing, but because he departeth hence having his former sins upon him." 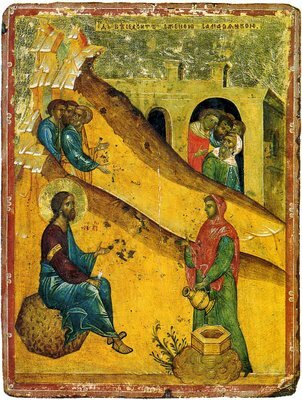 The Samaritan Woman – 5th Sunday of Pascha – John 4:5-42. New Homily. How to acquire the Holy Spirit. The Lord puts Himself in our path. Knowledge comes to us by degrees, a little bit at a time. 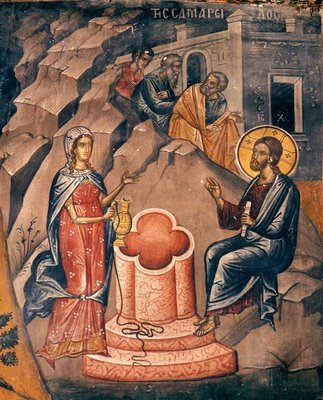 Brothers and sisters, as the Samaritan woman said, “This well is very deep.” And there is much in the story; we could speak for days and not exhaust the story of the conversion of Saint Photini, Equal to the Apostles, the Samaritan Woman. As in all scripture, it is good to see the part that is the most important. The story here is about how to obtain the Holy Spirit. And the Samaritan Woman did obtain the Holy Spirit. The Holy Spirit is referred to sometimes as water, sometimes as fire. Because as water, it washes clean. As fire, it warms, and it burns away sin. In this case, the Lord referred to the Holy Spirit as Living Water. And he met the Samaritan Woman where she was, going to the well when no one else was going at about noon, the sixth hour, because she had had five husbands and now was living with a man who was not her husband. So for her to go get water at the normal time, would subject her to ridicule. So she would sneak to the well at noon to get water. And the Lord knew this because the Lord knows all things. We continually see in the Gospels where the Lord puts Himself in the path of someone who needs His help. The woman whose son had just died, the man left by the road half dead, the woman with an issue of blood. He made Himself to be present for them in their time of need. This woman didn’t even know she had a need. She was getting by day-to-day and life was not easy for her. Anyone who goes to get water in the heat of the day obviously has some problems. Although she didn’t know what she needed, the Lord knew, and so He spoke to her on her level. First He did something rather amazing for a Jew. The Jews considered the Samaritans to be like dogs and were very racist about them. And yet He spoke to her and said, “Give me to drink.” – an amazing thing! She noted that, that: “The Jews don’t have anything to do with us, and You’re asking me to drink.” That was the beginning, so that they could have a conversation, so that she could learn about the Living Water. And of course I told you, the whole period of Pascha is speaking about enlightenment and how it occurs. Now, it’s different for different people. For the myrrh-bearing women, they went to the tomb thinking they were going to anoint a dead man, not even knowing how the stone would be rolled away. But, because of their great love, they came. Thomas couldn’t believe, but then he couldn’t go away either. He had too much love, too much yearning in his heart. So he received that which he didn’t even know that he desired, because he believed the one whom he though might be the Christ was dead. The paralytic first was healed; then he knew that God was with him, and he knew that the cause of his illness had been his sins and that he was not to sin anymore or else a worse thing would befall him. In every case, the common thread is that man, when presented with God, must react. We must listen. We must change because God is not some static thing, some fact which we can believe. God is life. So when we are presented with God, we must change. And certainly in the case of the Samaritan Woman, the proper reaction to God is perhaps illustrated more than even all the rest. Because this woman who was a sinner, who was basically an outcast in a society of outcasts, this woman, when she started to speak with Jesus and He told her bit by bit about the truth in words that she could partially understand, she had her view that was not correct. There are theological questions here that are interesting to look at, but they are a side issue. Suffice it to say that this woman like us had misconceptions; We have many misunderstandings, things we don’t know; and we don’t know that we don’t know them. But the Lord enlightened her. Enlightenment does not complete until we change. So the woman knew some things of the truth. He offered this Living Water, this tantalizing opportunity to not thirst again. He told her something of true worship, and then he told her to go call her husband. And she was ashamed; our services speak of it. She said, “I don’t have a husband.” That’s the truth, but not the whole truth, because she was ashamed to say what her true life circumstances were. But the Lord gently told her, “Yes, you’ve had five husbands, and the one you have now is not your husband, and this you spoke truly.” So He praised her for being truthful and gently, kind of ignored that she wasn’t completely truthful. He didn’t legally upbraid her for it. And what did she do? She said, “I perceive you are a prophet.” I am sure at this moment there was something in her heart that felt hope because she was living in a way she didn’t want to live, but she didn’t know how to get out of it. She was trapped. She lived a sinful life for many years, but she did believe she knew something of the law. She was a careful person; she asked intelligent questions, according to her level of understanding. She needed healing. And then when the Lord told her of her life, her heart must have felt this flicker of hope and warmth and maybe she could get relief. Now, most people would not feel that. They instead would be angry that their sins had been shown. The Jews were like that, the Pharisees and Sadducees did not like when the Lord showed their hypocrisy. The people of the Gadarenes had been raising pigs unlawfully. Then the Lord removed this source of sin from them. And they knew that they had been sinning. What did they do? They were afraid but also angry, and they told the Lord to leave because they didn’t want their sins to be exposed. Now, let’s be realistic here. If she tells someone that, they are going to say, Well, what did He tell you? So she would have to tell people of her sins in order to show that this man had told the truth about her. What nobility of soul! To be presented with your sins and to not be angry, but instead to be glad. This is an amazing, amazing story. There aren’t many like it in the scriptures. This is how we must be. Yes, we know something of God. Okay. We know he’s Trinity. We know he’s born of a virgin. We know Jesus Christ is God and man. We know all these things. But do we live them? Have we become them? The Lord said at one point to her, “If thou knewest the gift of God, and who it is who sayeth unto thee, give me to drink, thou would ask, and I would give you Living Water.” Do we know the gift of God? It is not possible to know the gift of God without becoming like God, without changing as God reveals himself to us. This is what the story tells us. If we want to have the Holy Spirit abiding in us — and the Holy Spirit is life; without the Holy Spirit there is no life — To have the Holy Spirit abide in us, we must, when God reveals himself to us, change. Not slink back, not be angry, not hide ourselves from God, and not cause ourselves to be distracted by this and that in life. But we must be like the Samaritan Woman. This is what the story tells us. This is the way of life. Because salvation is not just forgiveness. How in the world did that idea come about? A person forgiven seventy times seven is still a sinner and still bears wounds of sin and still is incomplete and hurting. Salvation is to become changed, to become holy. To become one who used to have five husbands and lives with someone who is not their husband, to someone who becomes equal to the apostles. And full of life and purpose. This is what salvation is. Is the changing of the soul, to be perfected. But it is only possible with our participation. God reveals Himself to us; otherwise, we would not know him. We know this. This is a fundamental dogma of our faith. But as He reveals himself to us, if we do not reveal ourselves to Him, He will stop revealing Himself. And we’ll only know facts about him. But we won’t know about life. And we won’t have the water springing up in us, the Holy Spirit. It is only possible to have the Holy Spirit if, when God reveals himself, we change. This is Christianity. It is not just belief. It is not just our practices, although all of those things assist us. It is when you meet God, you listen and you change, and this is what this woman did. This is why this story is so glorious. And this is what we must compare ourselves to. How much are we like this woman? Well, if we are honest, we know we are like her in at least one way. We sin and we have misconceptions, misunderstandings, things we don’t know. We are entangled in things like she was entangled. So we are like her, yes, absolutely. But when she met God, she reacted with joy. You know, she came to get water. And the apostle tells us she left her water pot to go into the city because she had found the Living Water. It’s a very significant detail, one of those little pearls in the scripture. I love to read that line: “The woman left her water pot.” This is not an incidental detail. She had found the way of life, and she was becoming truly alive. We have been presented with the way of life. How is it then that we do so many things that are not the way of life? Because we have not met God as she has. Oh, God has presented Himself to us, just as He did to her: On our level, according to our understanding. But we have not reacted to Him as she did. She turned her life upside down. She changed completely. She reminds me of Mary of Egypt, when Mary of Egypt saw that she had been a sinner and she made the promise to the Mother of God. From that point on her life was completely changed. When we meet God, we must change. That is what I want you to learn from this story. If you are to have the Holy Spirit in you, you must listen to what God is telling us and change. And God help you to listen and to change. Amen. Our parish Email list (http://groups.google.com/group/saint-nicholas-orthodox-church) also has all the latest postings from our website and blog; everyone is welcome to join. 1. Vladyka Daniel was always himself, without any pretence, without any ambition, without any fear, without any considerations of political correctness. He was a multilingual, multitalented genius. While being completely loyal and devoted to the Orthodox faith and serving the Orthodox Church as priest and bishop, he pursued his own interests, which could include sailing ships and translating an odd work from one language into another even though no one was interested in it. His life shows that a priest of the Church does not have to be a conformist, a man-pleaser, a servant of expediency. 2. Vladyka Daniel was chiefly devoted to the Old Rite, which has always seemed to the majority of Orthodox people to be an incomprehensible lost cause. He travelled around and ministered to scattered groups of Old Ritualists, seeking to keep them within the saving enclosure of the Orthodox Church. His long years of scarcely-rewarded labours in this field at last bore fruit in 1982, when, following his example, one of the largest parishes of Old Believers in existence outside Russia was reunited with the Russian Church Abroad. The Old Rite Church of the Nativity of Christ in Erie, Pennsylvania, was founded around the turn of the 20th century and remained isolated from the main body of Orthodox believers until its pastor, Father Pimen Simon, led his flock into the Church. Vladyka Daniel served as an inspiration for this parish and a guarantee that they could forever continue to maintain the sacred traditions of Old Russia as they had been preserved for centuries, substantially unchanged. When Father Dimitri Alexandrow became Bishop Daniel of Erie and subsequently moved to the parish, he became their archpastor. In this Vladyka Daniel, although he had only one (rather large) parish under his direct guidance, fulfilled a historic role. Although the Russian Orthodox Church had allowed the use of the Old Rite at least since 1800 under the terms of the "Edinoverie" (oneness in faith), the Old Ritualists were not treated with complete acceptance and trust. As far as I know, before the episcopal consecration of Bishop Daniel, there had been only one other Old Ritualist bishop in the Russian Orthodox Church, the Holy New Hieromartyr Simon (Shleyev), Bishop of Okhta. Although there have been hierarchs who drew close to the Old Ritualists, such as our Metropolitan Antony (Khrapovitsky), of blessed memory, and the Holy New Hieromartyr Andrew (Prince Ukhtomsky) of Ufa, and in our days Metropolitan Juvenaly of Krutitsy and Kolomna, Bishop Daniel was unique in being a bishop of and for the Old Rite. His existence was a seal upon the unity of the Old and New Rites in one Russian Orthodox Church. 3. Vladyka Daniel rendered a great service to our Russian Church Abroad by what he did not do. Always independent-minded, he never subscribed to the ideology of gracelessness, and believed that the Church Abroad should be in communion with the Church in Russia. This was his position even in the dark days of suspicion and isolation, when fear of Communism and horror of Soviet persecution were the prevailing winds in our church life. When the wind changed and even churchmen who had been vocally anti-Moscow became ardent adherents of the Patriarchate, Vladyka Daniel still remained independent. He feared that our little church would be swallowed up by the much-larger Patriarchate. He desired our Church to enjoy that independence of spirit that had characterized his own life. 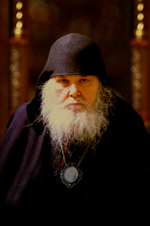 Because Bishop Daniel would not consent to join Bishop Agathangel in forming a synod and ordaining new bishops, Bishop Agathagel was left in the untenable position of claiming to be the sole remaining hierarch of the Russian Church Abroad, and after some time he had to seek out the aid of one of the Greek Old Calendarist groups to create his hierarchy. Thus, Vladyka Daniel, by remaining, as always, who he was, what he was and where he was, deprived the followers of Bishop Agathangel of the support and prestige his accession would have contributed to their cause and their claims. Vladyka Daniel to a visitor: Would you like to join our new society, the "Three F" Society? Visitor: What do the three Fs stand for? Vladyka: Ah, you see, you are already one of us! Memory eternal to the Right Reverend Bishop Daniel! The Holy Cornelius the Centurion is commemorated Sept 13 (9/26 on the civil calendar). He became a bishop (by the Apostle Peter, whom he traveled and preached with), and a martyr. His life is available in the Menologion program (recommended, if you have a PC), or the Prologue. The conversion of Cornelius is told in the entire 10th chapter of Acts, serialized on the 4th Monday, Tuesday and Thursday of Pascha (skipping Wednesday, since it is the important feast of Mid-Pentecost). An important aspect of St Cornelius’ life, which we must take to heart is that he believed in the true faith before he was baptized, while appearances were that he was a pagan (since all Roman soldiers were de-facto pagans), and in any case, was certainly not circumcised, and therefore, a Gentile. . Things are not always as they seem. People are rarely as they seem. God will answer the prayers of anyone who seeks Him. The Holy Apostle Peter had to be convinced by a startling vision to accept that Cornelius could become one of the household of faith. The vision of St Peter was meant specifically for a Jew, who followed the Law. After the resurrection, for a considerable time, the Apostles continued to observe the dietary and other laws. Peter was a good Jew. As such, and not understanding as of yet Lord’s frequent references to the calling of the Gentiles, he would in no way “defile himself”, by entering the home of a Gentile. We must also recognize, not expecting startling visions, but instead being guided by our compassion and humility, that there is good in most people, and also belief. If it is not Orthodox belief, it is not perfect, but a heart that seeks God will find him. Of course, who among us can say that our faith is wholly Orthodox? Since faith is lived, and we are filled with passions and weaknesses, our personal faith is not pure. One must be discerning concerning those outside the church. We should not go into a synagogue of Jews and pray with them, nor sing out in tongues in an Assembly of God service, but we must recognize that God can call anyone, from anywhere, if they are seeking Him. We had best not let our prejudices and pride get in the way! Fr Silouan’s attitude towards those who differed from him was characterized by a sincere desire to see what was good in them, and to not offend them in anything they held sacred. He always reminded himself; he was utterly convinced that ‘salvation lies in Christ-like humility’, and in virtue of this humility he strove with his whole soul to interpret every man at his best. He found his way to the heart of everyone – to his capacity for loving Christ. Note also the character of St Cornelius, a man with many responsibilities and difficulties, who feared God, gave alms and loved the true faith, no doubt at considerable personal risk. As always, when we read the scripture, we must make comparisons. He was not in the “household of faith” when he was initially doing these things. Do we give alms? Do we live piously? How can we do otherwise, when some who even do not have the true faith do things that are more pleasing to God than we? 4th Monday of Pascha: Acts 10:1-16 1 There was a certain man in Caesarea called Cornelius, a centurion of the band called the Italian band, 2 A devout man, and one that feared God with all his house, which gave much alms to the people, and prayed to God alway. 3 He saw in a vision evidently about the ninth hour of the day an angel of God coming in to him, and saying unto him, Cornelius. 4 And when he looked on him, he was afraid, and said, What is it, Lord? And he said unto him, Thy prayers and thine alms are come up for a memorial before God. 5 And now send men to Joppa, and call for one Simon, whose surname is Peter: 6 He lodgeth with one Simon a tanner, whose house is by the sea side: he shall tell thee what thou oughtest to do. 7 And when the angel which spake unto Cornelius was departed, he called two of his household servants, and a devout soldier of them that waited on him continually; 8 And when he had declared all these things unto them, he sent them to Joppa. 9 On the morrow, as they went on their journey, and drew nigh unto the city, Peter went up upon the housetop to pray about the sixth hour: 10 And he became very hungry, and would have eaten: but while they made ready, he fell into a trance, 11 And saw heaven opened, and a certain vessel descending upon him, as it had been a great sheet knit at the four corners, and let down to the earth: 12 Wherein were all manner of fourfooted beasts of the earth, and wild beasts, and creeping things, and fowls of the air. 13 And there came a voice to him, Rise, Peter; kill, and eat. 14 But Peter said, Not so, Lord; for I have never eaten any thing that is common or unclean. 15 And the voice spake unto him again the second time, What God hath cleansed, that call not thou common. 16 This was done thrice: and the vessel was received up again into heaven. Not read in the lectionary: Acts 10:17-20 Now while Peter doubted in himself what this vision which he had seen should mean, behold, the men which were sent from Cornelius had made enquiry for Simon's house, and stood before the gate, (18) And called, and asked whether Simon, which was surnamed Peter, were lodged there. (19) While Peter thought on the vision, the Spirit said unto him, Behold, three men seek thee. (20) Arise therefore, and get thee down, and go with them, doubting nothing: for I have sent them. 4th Tuesday of Pascha: Acts 10:21-33 21 Then Peter went down to the men which were sent unto him from Cornelius; and said, Behold, I am he whom ye seek: what is the cause wherefore ye are come? 22 And they said, Cornelius the centurion, a just man, and one that feareth God, and of good report among all the nation of the Jews, was warned from God by an holy angel to send for thee into his house, and to hear words of thee. 23 Then called he them in, and lodged them. And on the morrow Peter went away with them, and certain brethren from Joppa accompanied him. 24 And the morrow after they entered into Caesarea. And Cornelius waited for them, and he had called together his kinsmen and near friends. 25 And as Peter was coming in, Cornelius met him, and fell down at his feet, and worshipped him. 26 But Peter took him up, saying, Stand up; I myself also am a man. 27 And as he talked with him, he went in, and found many that were come together. 28 And he said unto them, Ye know how that it is an unlawful thing for a man that is a Jew to keep company, or come unto one of another nation; but God hath shewed me that I should not call any man common or unclean. 29 Therefore came I unto you without gainsaying, as soon as I was sent for: I ask therefore for what intent ye have sent for me? 30 And Cornelius said, Four days ago I was fasting until this hour; and at the ninth hour I prayed in my house, and, behold, a man stood before me in bright clothing, 31 And said, Cornelius, thy prayer is heard, and thine alms are had in remembrance in the sight of God. 32 Send therefore to Joppa, and call hither Simon, whose surname is Peter; he is lodged in the house of one Simon a tanner by the sea side: who, when he cometh, shall speak unto thee. 33 Immediately therefore I sent to thee; and thou hast well done that thou art come. Now therefore are we all here present before God, to hear all things that are commanded thee of God. 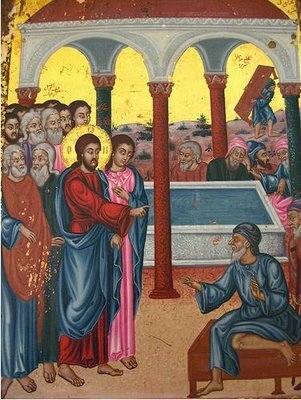 4th Thursday of Pascha: Acts 10:34-43 34 Then Peter opened his mouth, and said, Of a truth I perceive that God is no respecter of persons: 35 But in every nation he that feareth him, and worketh righteousness, is accepted with him. 36 The word which God sent unto the children of Israel, preaching peace by Jesus Christ: (he is Lord of all:) 37 That word, I say, ye know, which was published throughout all Judaea, and began from Galilee, after the baptism which John preached; 38 How God anointed Jesus of Nazareth with the Holy Ghost and with power: who went about doing good, and healing all that were oppressed of the devil; for God was with him. 39 And we are witnesses of all things which he did both in the land of the Jews, and in Jerusalem; whom they slew and hanged on a tree: 40 Him God raised up the third day, and shewed him openly; 41 Not to all the people, but unto witnesses chosen before God, even to us, who did eat and drink with him after he rose from the dead. 42 And he commanded us to preach unto the people, and to testify that it is he which was ordained of God to be the Judge of quick and dead. 43 To him give all the prophets witness, that through his name whosoever believeth in him shall receive remission of sins. Memory Eternal! +Daniel of Erie. Vladyka Daniel reposed in the Lord after a long illness this morning. He visited our parish several times and regaled us with many edifying stories. He also was involved in the design of the St Seraphim Cathedral in Dallas. In the 1950's he was asked by the Metropolitan to come to St. Nicholas in Dallas and be the parish priest. He told me that he understood parish mostly Spanish speaking. He got a blessing from St. John of Shanghai and San Francisco to serve the Old Rite and declined to come to Dallas. Being very obedient he did come many years later to help. He was fluent in 26 languages. He once sat at my house and used our Hebrew typewriter. He napped at our house. He said most of his brother bishops would be uncomfortable. He said it reminded him of his. We had a wonderful conversation about grief as we traveled together through the hill country from Dallas.We went through south Dallas and he told me the affirmative action joke about a man who went to language school and mastered the Russian language and all the local area accents. He was secretly released into Russia. Walking through the villages and talking to people he was soon arrested. He asked how they knew. They said that it was his Pushkin skin color. John 5:1-15 1 After this there was a feast of the Jews; and Jesus went up to Jerusalem. 2 Now there is at Jerusalem by the sheep market a pool, which is called in the Hebrew tongue Bethesda, having five porches. 3 In these lay a great multitude of impotent folk, of blind, halt, withered, waiting for the moving of the water. 4 For an angel went down at a certain season into the pool, and troubled the water: whosoever then first after the troubling of the water stepped in was made whole of whatsoever disease he had. 5 And a certain man was there, which had an infirmity thirty and eight years. 6 When Jesus saw him lie, and knew that he had been now a long time in that case, he saith unto him, Wilt thou be made whole? 7 The impotent man answered him, Sir, I have no man, when the water is troubled, to put me into the pool: but while I am coming, another steppeth down before me. 8 Jesus saith unto him, Rise, take up thy bed, and walk. 9 And immediately the man was made whole, and took up his bed, and walked: and on the same day was the sabbath. 10 The Jews therefore said unto him that was cured, It is the sabbath day: it is not lawful for thee to carry thy bed. 11 He answered them, He that made me whole, the same said unto me, Take up thy bed, and walk. 12 Then asked they him, What man is that which said unto thee, Take up thy bed, and walk? 13 And he that was healed wist not who it was: for Jesus had conveyed himself away, a multitude being in that place. 14 Afterward Jesus findeth him in the temple, and said unto him, Behold, thou art made whole: sin no more, lest a worse thing come unto thee. 15 The man departed, and told the Jews that it was Jesus, which had made him whole. Sunday of the Paralytic. 4th Sunday of Pascha. Wilt thou be made whole? A question we must answer at EVERY moment. In the scriptures, physical afflictions like paralysis, blindness, and leprosy often indicate or point to an even more serious problem. What is it? According to the scriptures, the witness of the fathers, and the overall mind of the church, what are at least two causes or reasons for physical infirmities? What is pointed to by the healing in the water? Who was the angel who "troubled the water"? Why do we know this? Wilt thou be made whole? Sunday of the Paralytic. 4th Sunday of Pascha. A question we must answer at EVERY moment. Healing of the Paralytic at the pool of Bethesda . Today is the Sunday of the paralytic, in which we hear the story of a man who'd been ill for thirty-eight years and was finally healed. We have much to learn from this story. 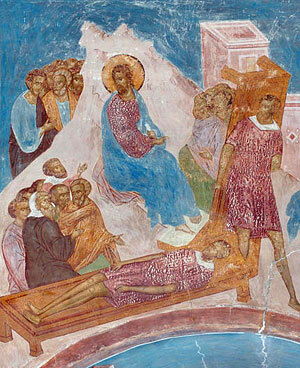 Now, the reason why it's said now, or part of the reason, is because, as the services said last night, at “mid-feast”, Jesus visited this paralytic. It's almost mid-feast now, it is almost mid-Pentecost. Pentecost is a feast of 50 days, and we're in that period awaiting Pentecost. And the Jews celebrated Pentecost also; they didn't understand the same meaning as we do, it changed, but they had a 50-day feast. Jesus came about towards the middle of that feast – mid-Pentecost – and saw this man by the pool of Siloam, with five porches there. We can learn many things from this short story. Certainly we can learn something about patience, endurance, not complaining about what is our lot in life, what's wrong with our life, what's going on that we don't like. We complain constantly and incessantly, and our complaining is a stench that rises up to God. Because when you complain, you're showing a lack of faith, a lack of obedience, a lack of love – indeed, a lack of understanding of who the God-man Jesus Christ is. Who of all among us, if anyone, could complain and feel justified – our Lord is the only one. But of course He understood what his task was and He took it joyfully, and with obedience, in order to save us by living on the earth, showing us the way, teaching us and then backing up what He said with His actions and his resurrection from the dead after His crucifixion. Indeed, we can learn a lot about patience by seeing this man; he wasn't complaining, and he was there for 38 years. We can also learn something about Who it is who can cure, and what it is that He really cures. Whether a man is withered, lame, blind, or whatever infirmity a man has, it is small compared to the infirmity of the soul. Jesus healed this man not just of his infirmity of being palsied, but of the infirmity of his soul. How do we know this? Because later on we see after he was healed and the man was in the temple – which is a good sign, he was thanking God – Jesus explained some things to Him. Now listen carefully! In our society we don't like to hear this, in our society this is somehow not allowed, people don't like to admit this, they almost think you're crazy or reactionary to make the connection with sin that our Savior did when He said, 'Thou art made whole, sin no more, lest a worse thing befall thee." Now the fathers understand – and if you just know English you can understand – that he's making a reference to his palsy, his being a paralytic was it some measure caused by his sins. This is not always the case. In fact, one time Christ was asked, "Was it because of the sins of his parents or himself that this man was born without eyes, blind?" Christ said neither one; if was that the glory of God might be made manifest. It's not always because of sins that a person suffers some affliction, but most of the time it is because of sins. Either because sin causes the affliction – smoking, drinking alcohol to abuse, drugs, and promiscuity, there's a long litany of things, diseases, that are caused by our own stupidity, by our wanton abuses. You can see fractured families because people don't deal with their anger, or their lust, or their impatience, or their selfishness; sin causes many problems such as that in a direct way. But in an indirect way sin causes many other afflictions, because we're so thickheaded we don't see God. We don't see God in the good things, and we take advantage of those good things and fall into depravity. So God, in His wisdom, in His love, in His mercy, chastises us in order so that we might cleave unto Him. It's the same principle with parents and their children; sometimes you must punish a child to help turn him to the right way, sometimes you must let a child suffer grievously in order to let him turn to the right way. If someone has a child that, let's say, gets involved in extremely dangerous and illicit behaviors and goes to jail, sometimes it's best not to bail the child out. God does the same thing with us. Our sins cause our suffering. This society doesn't like to say that – "oh, how can you say this?" It does happen, to all of us. So if you have any situation in your life you're not pleased with – whether it's a physical infirmity, whether it's a relationship, whether it's job, or neighborhood, or family or whatever it is, "Physician, heal thyself." Look the in mirror; look in the mirror of the soul. What's wrong with you? What's causing it? As I said before, it's possible that such things could be caused not through your sins at all, but because of something else. But for the most part, our sins cause our sufferings. And yet we complain, and we complain and we complain. But we always complain about that person and that person, but never ourselves. That's the person you need to complain about. Complain, ask God to help you with your sins, with that which fills you with evil. I was reading from a wonderful sermon by Bishop Nicholaj Velimirovich, and he said "A Christian should expect to suffer." How about that for politically incorrect speaking! He expects to suffer, and he is surprised and glad and rejoices when he does not suffer. He expects to suffer because of his sins, just as you, if you were subject to a king and had killed the king's deer, you expect that the king is going to have you executed. You're not going to complain about that, you're going to be sorry and ask for forgiveness to the king. And if the king gives you forgiveness – but you know, he'll say “Don't kill any more of my deer, but I forgive you this time” – then you'll rejoice. Now we can do this with an earthly king, but with our Heavenly Father we don't do this. We seem to think we're owed so much. We breathe it in the very air; it's so polluted with Western ideas that pollute us: "We're owed something." We're not owed anything in terms of your lot in life. All of our life is affected by Gods’ providence: some of it caused by God, and some of it allowed by God depending on your own ingenuity and your own abilities. But it all goes away in a vapor, how you lived, what you've done in this world. What matters is how your soul has developed, and if you're made whole. I see that there are three things in this story that really jump out at me. Now you know that the water represents baptism, and that the person who was put in the water was made whole. Notice how it is says "made whole"; not just their infirmity was healed, but they were made whole, but only one person, at one time in the season. Christianity is to make one whole. Baptism is for all men, not just for one man, at one time in the season. And the man said to Christ, when Christ said, "wilt thou be made whole?" he said, 'I have nobody to help me." And he was looking at the Man who would help him; he was looking at the God-man who would help him, and he didn't know who He was yet. Christ asks us this question continually. "Wilt thou be made whole?" And for the most part we answer him with a resounding "No." To some extent we've answered "yes"; we've come to the waters of baptism, we make an effort to fast, to come to the services – sometimes, unfortunately, a very poor effort to come to the services and I must mention that again. Don't lose your zeal; some of you are in very great danger of losing your zeal. "Yes, I want to be made whole, O Lord!" "No, I don't want to give up what I'm doing; I don't want to give up the sweetness of sin, or the sweetness of complaining, or the sweetness of excuses." "Yes, I want to be made whole! “I want to be cleansed of all my sins, and I don't blame Thee, the Lord, or my friends, or my family, or anyone else for my sins and for my afflictions; they are mine and mine alone, and they are my fault. But Thou canst heal it; Thou art the man that can bring me into the water and can refresh me." He is the One. We don't fully recognize that, either – oh, we believe it with our minds, with our lips, but if we really believed it we'd make much greater effort in living the Christian life. "Behold, thou art made whole; sin no more." Christianity is a constant process of becoming whole, but it involved two free wills – God's, who is perfectly free, and ours, which should be free but has become enslaved to passions and lusts and corruptible things. But we were made to be free. It was our purpose. God made us to have perfect freedom. You know the Gospel of John where it says: "he will go in and out and find pasture"? The sheep, being able to go in and out, go wherever they wish, perfect freedom, but freedom in godliness, freedom in purity, freedom in perfection. This is the purpose of our life – perfect freedom! So we have to answer Christ, when He asks us the question "wilt thou be made whole? ", "Yes!" And any portion which answers "no" we must confess with bitter tears. Stop making excuses for yourself. Don't make excuses for not being able to say your prayers, for not being able to come to church, for not being able to come to confession, for not doing this, for not doing that, for this reason, for that reason, for why you do this and why you do that. You know it’s all a lie. I know it is a lie in my own life, so I strive to be honest concerning these things also. It's a lie. And every time you make an excuse, you are saying "NO." You're saying "I don't want to be made whole. I like laying in the gutter, I like laying in filth. I like wallowing in my sins." Don't allow yourself to do this. That's why the church has an order. This order is not rules and regulations, it is for our benefit. That's why I must speak of it over and over, and especially during this season, because during this season is the most likely time for a person to fall away. Part of that is because God has given us such great grace on Pascha, and we hardly accepted it; we accepted a few things, we accepted some of the sweet meats, but we didn't accept and take into ourselves the resurrection. We couldn't bear it and so, because of unthankfulness, we're starting to fall away. I don't really know anybody who is honest who doesn't say that this happens to them during the Paschal season. It happens to me, but I struggle against it. So I beseech you, my brothers and sisters, struggle against this; don't make excuses, don't let your life be in the way of eternal life. Don't let your temporal life impair you, don't make excuses, don't say NO. If you understood what Christ is saying, and says, when He says "wilt thou be made whole? ", you'd be begging me to serve daily Liturgies. You'd be begging me, because you wouldn't want to go away from the temple, if you knew what wholeness really is. So taste God more and more, and as you taste more and more of God, you won't want to taste depravity. But if you don't continue to taste of Him, and to "mount up like eagles" as it says in the Scriptures, to struggle, then it'll be a gradual slide. It might not be anything you notice, it might not be anything I notice – and I tell what, I keep my eyes peeled because, although I'm unworthy, I'm called to be a shepherd here, so I watch and I worry and I wait and I pray. But you know, in the long run, I'm not responsible for your salvation. To some degree I might have to answer if my own sins have caused you to falter, but you are all responsible for your own salvation. In the context of living the Christian life in community and in obedience, you are responsible. Think a little about what it means to be whole. Which do you prefer – the inconstancy, the depravity, the weakness, the infirmity of this life, or wholeness, completeness, perfection and freedom? 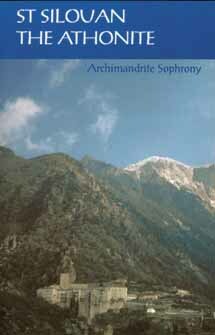 You and I are paralytics to some degree, sometimes to a great degree, and tragically this is usually of our own making. So when Christ asks you – and He's asking you today, He asks you every moment of your life – "Wilt thou be made whole?" You MUST struggle to say "YES" and then you MUST back up your promise with action, with effort, with desire. Then indeed, you will be made whole. You are currently browsing the Saint Nicholas Orthodox Church blog archives for April, 2010.